Notes One of the earliest extrasolar planets to be discovered, 70 Virginis b orbits its parent star, a yellow dwarf, at an average distance of less than half an Astrononical Unit. Further out in the same system, at some 3.5 AU from the central star, lies a disc of dust particles. A new day on Goldilocks: the sun-like star 70 Virginis rises over the cloudtops of its mighty planet. 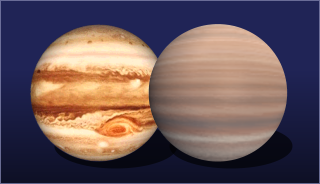 A gigantic planet, thought to be Jovian in structure, but with about seven times the mass of Jupiter. It orbits the nearby yellow star of 70 Virginis in a somewhat closer orbit than the Earth's around the Sun. 70 Virginis b was at first nicknamed 'Goldilocks' on the basis that it might support liquid water, or even life, among its moons. More recent discoveries have made that possibility seem remote, and the 'Goldilocks' planet is now thought to be too hot for liquid water or life after all. The diameter of 70 Virginis b is uncertain, but appears to be only slightly greater than that of planet Jupiter though considerably more massive. With a mass more than seven times that of Jupiter, it is therefore considerably more dense. Jupiter surface maps on this page courtesy Jet Propulsion Laboratory.